I am trying my best to get on track with my fitness and being a lot healthier. One thing I have started doing is downloading a few apps onto my phone to help me along the way, currently I have just the 3 installed on my phone but they are all helping me in their own little way. MyFitnessPal is an app that I install and uninstall far too many times in the past but now it is here to stay. It is time I started making note of what I actually eat and what I put in my body to try stay on track. It can show me the good days I have had and the bad. I just need to remember to keep updating it as I always used to forget. Of course as soon as I signed back up to the Pure Gym I had to get the app on my phone. It is a brilliant way to track how often you go to the gym along with telling you how many others are in there if you are planning to go. I love how it also tracks your workout activity as it will show you how often you go and stay for. There is also a section on here with workout plans, you have to pay £5 extra for these but I don't think that is bad for an 8 week plan. The app is also an easy way to book into classes, I don't go to any at the moment but who knows I may go to some in the future. Finally on my phone I have installed the Nike training app, this is brilliant as it is full of workouts for every plan. I currently have downloaded ones for the USWNT players and I can't wait to get started on them. I am especially looking forward to the Alex Morgan fast forward session and the Ali Krieger summer strong session. When I signed up to the app I honestly couldn't believe how many options it had so I now need to sit and pick out some others I may like doing that will benefit my journey. 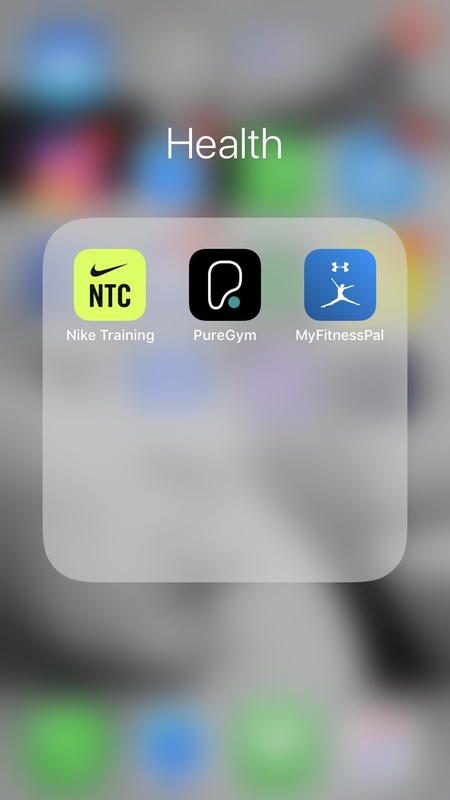 I am constantly on the look out for new apps to add for my health and fitness section so if you have any recommendations please let me know. I am also hoping to add a few football training ones into the mix. But for now these 3 are definitely going to help me along my journey and I especially can't wait to get training like the USWNT players from this. Also if you know of any YouTubers who may help me in regards to fitness or football please let me know and I will be sure to check them out. Who knows I may do a 1 month on review of these apps and my progress by using them.